Injured Whilst Using A Ladder At Work? Ladders are an important way of helping you do your job, but sadly they are also involved in many hundreds of accidents each year, causing injury and loss and even death. Employers have a duty to ensure that using a ladder at work is safe – they should assess the risk, draw up a safe plan, and supervise their use. Ladders are safe if the correct well maintained ladder is used, and proper training is made available, but each year we handle many ladder accident claims. If you have been injured in a ladder fall at work and want to find out more about making a ladder accident claim, please call us now on 0800 028 2060 or complete an online Ladder Accident Claim Assessment and let us help you. 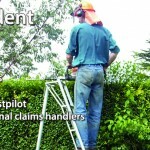 How we can help with a ladder accident claim. Unfortunately, the injuries suffered falling from a ladder are often significant, and involve substantial financial loss too, as all too often, people are away from work for a significant period of time. At Russell Worth, we have many years of experience of dealing with ladder fall and accident claims, so we know how employers sometimes avoid their responsibilities and what to do if that happens; we understand how injuries can be painful, frustrating, and disabling; we know how important it is to get you treatment as part of your claim, and how interim payments towards your losses can help you get back to normal as soon as possible. No win, no fee ladder accident claims. We offer a no win, no fee service for all ladder claims, and all initial enquiries are completely free of charge and without obligation, so you can contact us safe in the knowledge that it will not cost you a penny.